One of the most polarizing genres of music in my immediate circle is country. Some people refuse to listen to anything but the country stations, and others will throw a temper tantrum the very second the latest popular tune comes on. While not one of my personal go-to genres, it’s important we all are open to new things so I’m trying something outside of my comfort zone today. Keith Urban was born in October of 1967 in New Zealand. Moving to Australia as a teenager, Urban’s father owned a convenience store and wanted to get his son into music. He put an advertisement for a guitar teacher in the window, and Keith learned guitar from a local woman who he remains friends with to this day. At 17 he began entering local competitions and acting for a local theater company. He was a contestant on an Australia talent show called New Faces and began making his way into the country’s country music scene. In 1990 he signed with the EMI branch in Australia and released his debut album. After some pretty extensive touring through the early ‘90s, he was generating a solid following but the sales weren’t quite there. It was 1992 when he’d make the decision to move to Nashville, country music capital of the world. 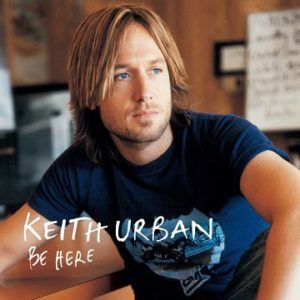 Today we’re fast forwarding about a decade to Keith’s fourth studio album titled Be Here, which was released in September of 2004. Having released a couple albums in the U.S., he had been gaining in popularity and this record had some large expectations. He’d won a couple Country Music Association awards and was quickly becoming a celebrity of sorts in those circles. Perhaps one of those more fascinating things about this record is who Urban wrote songs with. You may or may not remember a guy like Richard Marx from his pop music popularity of the late ‘80s/early ‘90s, but a guy like Elton John is sure to ring some bells for most music fans. He also did a couple covers on the record, which is very rare in today’s music world. The formula certainly worked, as this is Urban’s best-selling album at over 10 million sold worldwide. Admittedly, all I knew of Keith Urban’s music before this was hearing him sing along with contestants on American Idol. I was always impressed by his music knowledge and his clear recognition of good vocal talent. While I’m not sure if this album is indicative of his style across the board, it’s very non-country in many ways. It’s got a lot of up-tempo guitar and a bit more percussion focused in spots. It plays like maybe a country/pop/rock crossover record to me, which isn’t a bad thing. It seems like the vocal chops are there too, so all-in-all, a fairly solid album to listen to. It’s maybe a bit indistinct, in that I’m not sure if I heard one of the songs while walking in a mall, or a cover version at the county fair I’d be able to pick it out, but I could see putting this on and getting lost it in for an hour. Urban has been very vocal about his problems with addiction and the road to recovery. For that reason alone, I support his music simply because he is a good voice to those who may be in need. On top of that, the music is worth the $5 bucks–which always helps.